Any list of photographic tips is nearly endless. In starting this series of tips, I've decided to begin with suggestions that would have the most immediate impact on the quality of your pictures or that would be helpful answering the question of "which piece of camera equipment should I purchase next?" After the camera itself, I personally place the tripod as my second most important purchase. 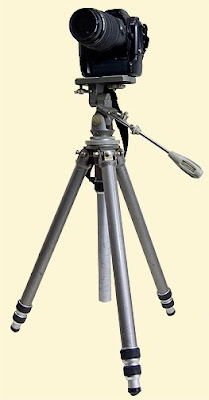 First time DSLR users might see a tripod as a boat anchor to their mobility. In reality, a tripod is the accessory that provides the most immediate impact on image quality and composition. Tripods, by their very nature, force photographers to take their time when composing their pictures. For these reasons, my tip is to make a quality tripod your second equipment purchase. Quality, in the case of a tripod, does equate to cost. Expect to spend $75 to $150+ on a good tripod. Studies conducted on pictures taken with and without tripods have repeatedly shown that final prints are visibly sharper when the camera is mounted on a good tripod. This is true regardless of the shutter speed used. So, as logic would suggest, a picture taken at a slow shutter speed of say 1/15th of a second is sharper when the camera is mounted on a tripod. But surprisingly, the same is true when we compare two pictures taken at 1/1,000th of a second. That's why you see professional photographers taking those breathtaking landscape photos using a tripod -- even on a bright sunny day. Good photography is work. And a tripod is a big step towards sharp images. Working with a tripod takes time. It forces the photographer to consider the scene and his/her composition. Now you've moved from taking a snapshot to spending time to consider other important components of a good picture -- angle, lighting, elements within the picture, depth of field, etc. That's a very good thing when you're starting out in photography. Tripods force us to consider the artistic elements of the pictures we're taking. Good photography is work. And tripods make us think about our craft. Of course there are times when a tripod is not appropriate. Tripods don't ususally work well at sporting events. (However, you'd be surprised at the number of monopods used by the photographers at Sports Illustrated. Monopods are the little brothers of tripods - using only one leg to stabilize the camera and lens.) But whenever possible use a tripod. What do I look for in a good tripod? Stability. A good tripod doesn't shake or move when you depress the shutter release button. Skinny tripod legs generally mean lighter weight for mobility, but they can also mean less stability. The purpose of a tripod is to provide stability, so it shouldn't move when you press the shutter button. Maximum height when extended. A good tripod will allow the camera to be elevated to normal eye level position. Minimum height. This is not only a consideration for backpackers, but also to allow you to get up "close and personal" to a subject that is low to the ground. Head/Camera Platform. Look for a tripod with a head that provides maximum swivel adjustments from side to side and up and down. The camera platform itself should allow you to quickly mount your camera and be big enough to cover the entire bottom plate of your camera. Locks. The locking devices used to secure the legs and the camera head at various heights should be easy to manipulate and secure. They must hold the camera in position at any angle with no movement. The nice thing about selecting a tripod is that you can try out various models with your camera at your favorite camera store. No guesswork. Ultimately, the model you buy is a personal decision. But never compromise on STABILITY. If you decide that a tripod is just too much to carry around, then don't forget my next option -- a monopod. Apply the considerations shown above when you evaluate a monopod. In the end, either a tripod or a monopod is a significant improvement to hand holding your camera. Here are a few companies that make excellent tripods: Gitzo, Bogen/Manfrotto, SLIK, Benbo and Vanguard. Of course, there are many more, but these are tripods I have used. The tripod is definitely one commodity where the adage of "you get what you pay for" applies. Next up - tips for buying lenses for your camera.